Neonatal physicians and nurses joined substance abuse providers from across the region for Orange County Mayor Teresa Jacobs’ Third Annual Orange County Drug Abuse Summit which was hosted by Winnie Palmer Hospital for Women and Babies. The summit which took place in February was held at Winnie Palmer Hospital, one of the nation’s premier hospitals for obstetric and neonatal care. “Working with Winnie Palmer is such a natural choice. When we are talking about protecting the tiniest victims and their mothers from the heroin epidemic, you cannot have those conversations without the extraordinary team at Winner Palmer. In terms of advocacy and expertise for this special population, I can’t think of a stronger partner,” said Mayor Jacobs. This year’s summit included Dr. Stephen Patrick, assistant professor of Pediatrics and Health Policy at Vanderbilt University School of Medicine and an attending neonatologist at Monroe Carell Jr. Children’s Hospital at Vanderbilt. Dr. Patrick is a national expert and published author who has been recognized for his extensive research on improving outcomes for opioid-exposed infants and women with substance-use disorder. In 2015, Florida’s Agency for Health Care Administration reported that there were 2,487 babies born with a condition known as neonatal abstinence syndrome (NAS), which is the medical term for the presence of opiate withdrawal symptoms in a newborn due to intrauterine drug exposure. The number of NAS cases seen across the state in 2015 represents an increase of more than 600 percent since 2005. In Orange County, the number of NAS cases increased from 34 to 249 over the same period, ranking Orange County as the third highest in the state. 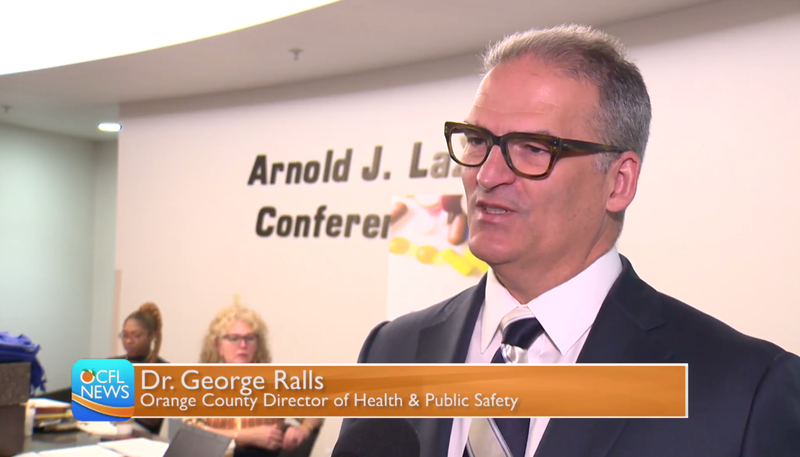 Orange County’s Director of Health and Public Safety Dr. George Ralls explains that the signs and symptoms of NAS among infants exposed to heroin or other opioids during pregnancy can vary. “Some NAS babies may tremble, others may have more severe muscle spasms or seizures, but all of these babies universally experience distress and discomfort as they suffer through the pain of opiate withdrawal,” said Dr. Ralls. While the affects can be short term, for some infants the results could be more serious causing lifelong medical complications. The Orange County Drug Abuse Summit was launched in 2014 as part of a series of recommendations made by Mayor Teresa Jacobs’ Prescription Drug Task Force. As prescription drug abuse intervention efforts took hold, communities across the country, including our own, witnessed an epidemic rise in the use of Heroin. In August 2015, due to alarming increases in the number of heroin overdose related deaths, Mayor Jacobs partnered with Orange County Sheriff Jerry L. Demings to convene the Orange County Heroin Task Force. The Task Force brought together high-level community leaders, including Ninth Judicial Circuit Chief Judge Frederick Lauten, state and local law enforcement partners, corrections officials, medical professionals, educators, substance abuse experts and concerned citizens, to develop key recommendations on how to best impact the problem of heroin use in Orange County. On March 14, 2016, the Orange County Heroin Task Force unanimously approved 37 recommendations in the areas of law enforcement, healthcare, education and treatment. Implementation of the 37 recommendations is ongoing, with several community partners working alongside local government to tackle the problem at hand. Orange County’s partnership with Winnie Palmer Hospital for Women and Babies in addressing neonatal abstinence syndrome by raising awareness and coordinating resources prior to delivery is a vital part of the overall plan. Video Caption: Orange County Mayor Teresa Jacobs’ Third Annual Orange County Drug Summit focuses on helping newborns exposed heroin.